Whether you would like a den, club house, doll's house or castle, playhouses create a great environment for your children to play outdoors safely whilst providing hours of fun. There are a variety of sizes and designs available to create the ideal hideaway for the children. The play houses are made out of tongued and grooved boarding and the boards are treated with an water based treatment unless stated. The detailed specification is listed with each model shown. PRICES SHOWN INCLUDE FITTING within a specified radius please see terms and conditions for further information, if your home is out of area please get in touch to receive a quotation for fitting. 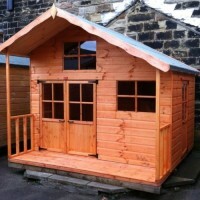 Oil based treated timber Option of 16mm Tongued Grooved Board or 19mm Barrel Board Internal L..
To extend your playhouse by adding the verandah to the playhouse, 8ft x 2ft ..
Oil based Treated Timber Option of 16mm Tongued Grooved Board or 19mm Barrel Board Includes 2..
Oil based Treated Timber Option of 16mm Tongued and Grooved Board or 19mm Barrel Board Includ..
Oil based Treated Timber Option of 16mm Tongued and Grooved Board or 19mm Barrel Board Fancy ..
Oil based Treated Timber 16mm Tongued and Grooved Board 6' x 2' Image shows Fantasi.. Treated Timber Option of 16mm Tongued and Grooved Board or 19mm Barrel Board Green painted Fa.. Treated Timber Option of 16mm Tongued and Grooved Board or 19mm Barrel Board Verandah include.. Treated Timber Option of 16mm Tongued and Grooved Board or 19mm Barrel Board Window Box Siz.. Treated Timber Option of 16mm Tongued and Grooved Board or 19mm Barrel Board Fancy Fascias ..
Verandah for Upstairs Downstairs Play house To extend your playhouse by adding the vera..